Custom artificial coral reef inserts are sustainable and also a great solution for customers wanting to recreate the underwater reef look and feel, while housing marine species that are not reef safe (i.e. puffers, triggers). Artificial coral reef inserts are not only beautiful, but also serve a functional purpose, often hiding aquarium plumbing and filtration systems. Indoor Oceans has established relationships with the top manufacturers to bring you high quality, natural-looking artificial coral reef inserts. The artificial coral reef inserts Indoor Oceans uses in customer tanks are made in the USA. 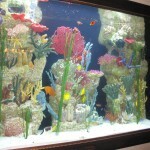 Beautiful artificial coral insert in custom tank by Indoor Oceans. 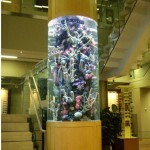 Magnificent artificial reef insert in custom cylinder tank by Indoor Oceans. Both insert and tank were manufactured in the USA. 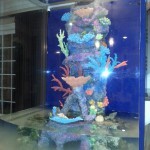 Interested in having a stunning custom aquarium with artificial coral in your own home or office? Give the experts at Indoor Oceans a call today and we’ll help you make your tank dream a reality.